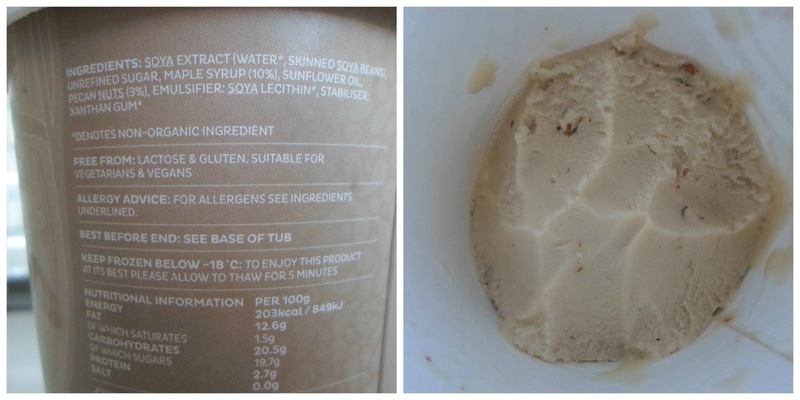 I finally got my hands on a tub of Jollyum after asking a local store if they would consider becoming stockists. Jollyum is an organic soya based frozen dessert and non dairy alternative to ice cream. It is available in four flavours - Summer Strawberry, Double Chocolate, Passion Fruit & Chocolate and Maple & Pecan. Compared to other brands of non dairy ice cream, these flavours were the main reason to track down this ice cream, they are enticing to me. I bought Maple & Pecan and it is true to the ingredients and tastes natural. I do not think it is as creamy as Swedish Glace but still feels indulgent. I like the pecan pieces as they add crunch. Could I have finally discovered a Ben & Jerry's dairy free dupe? If only I had a point of reference, I am of course purely guessing. I just have a couple of criticisms which are to do with the packaging. The allergens are underlined and are very difficult to spot on the ingredients list. I definitely prefer the bold technique which most manufacturers seems to be adopting in preparation for the new regulations. The other issue I have boils downs to wording. You'll notice the statement "free from lactose & gluten". I get very frustrated when lactose free is used as a replacement for dairy free because they are two different issues in the world of allergies. At £5.99 a tub this is an indulgent treat for me and one which I would not be willing to sharing and would keep in the freezer for those emergency PMS days. I'd recommend giving Jollyum a taste test and I intend trying another flavour in the future. I just have one wish, if only they made peanut butter and chocolate then I would be in heaven. Another great find, thank you for sharing. I agree with your concerns on the labelling. The underlining is very difficult to read. As I avoid lactose and dairy I couldn't agree more about the wording. Yes it states vegan but why not make more of a point of stating dairy free?